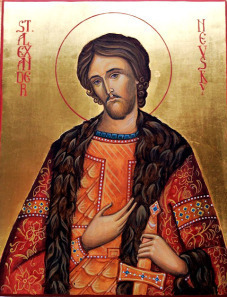 Grand Prince St. Alexander Nevsky lived in the mid-13th century. He is an example of how public service can be combined with an exemplary God-centered Christian life. At the end of his life he was tonsured a monk, and reposed in 1263. 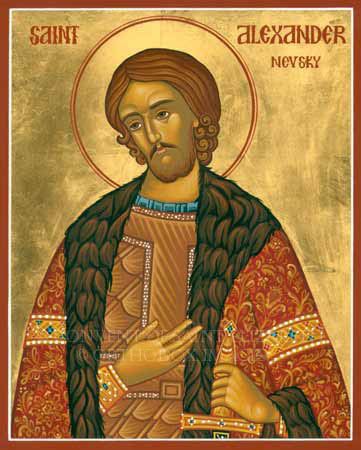 He was glorified as a saint just 20 years later, and for over 700 years he has been highly revered as a patron and protector of Russia and of the Orthodox Faith, as he was in his lifetime. Not long after, the Mongol Tartars started their invasion from the east, and laid waste to most of the Russian lands, brutally slaughtering all those who resisted, but allowing the people to practice their Orthodox Faith if they did not resist, and if tribute were paid. In 1241, the city-state of Novgorod, in the far northeast of Russia, begged St. Alexander to protect them against a far worse enemy than the Mongols — the German Teutonic and Livonian knights — brutal crusaders, whose purpose, besides capturing their lands, was to force the Russians to renounce their Orthodox Faith and become Roman Catholic. 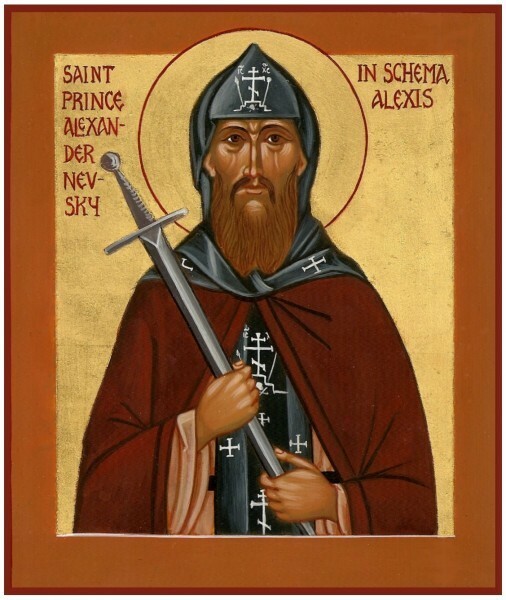 Thus, with much wisdom, St. Alexander humbled himself and paid tribute to the Mongol Tartars, so he could focus on defending Russia against the worse Western crusaders. In the famous "battle on the ice" in 1242, St. Alexander led the Russian people to victory over the western invaders, and protected their Orthodox Faith. 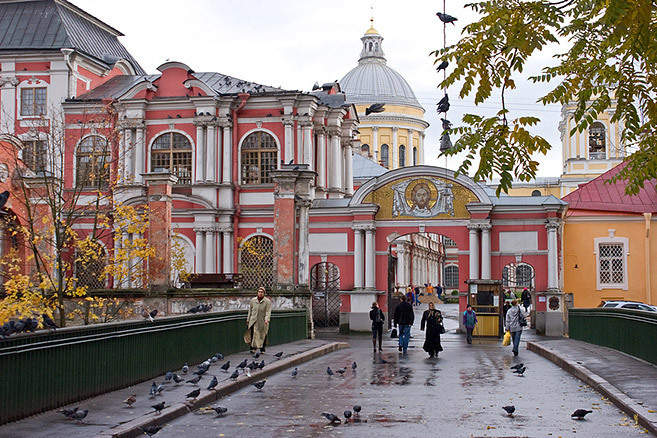 In 1710 Tsar Peter I, the Great, established a monastery dedicated to St. Alexander, built on the banks of the Neva River, on the legendary site of St. Alexander's victory over the Swedes, and in 1724 he had the saint's relics brought to St. Petersburg from the city of Vladimir. 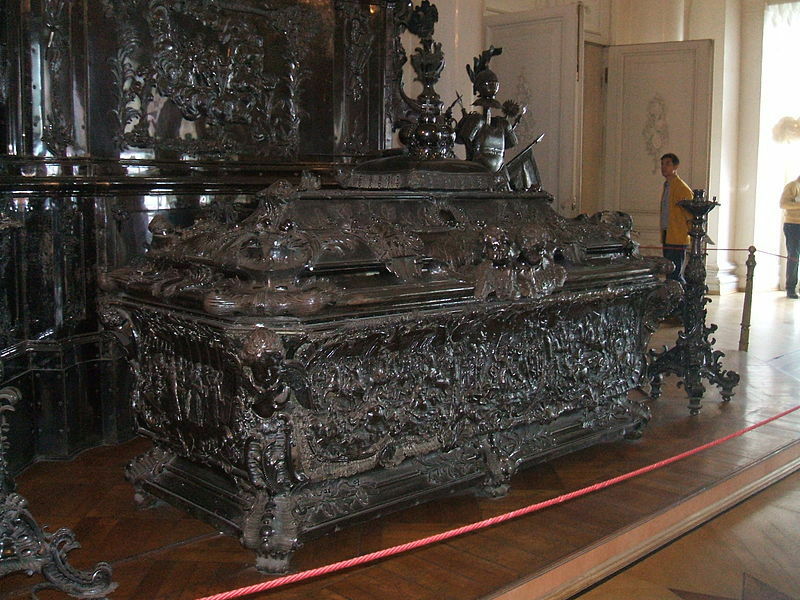 Tsar Peter commissioned an enormous, ornate, silver reliquary to hold the saint's relics, and had them placed in the monastery's Holy Trinity Cathedral. This (empty) reliquary is on display in the Hermitage Museum (photo to the left), and today a more modest reliquary holds the saint's relics. It is located in the cathedral, up front, on the right, readily accessible for veneration. 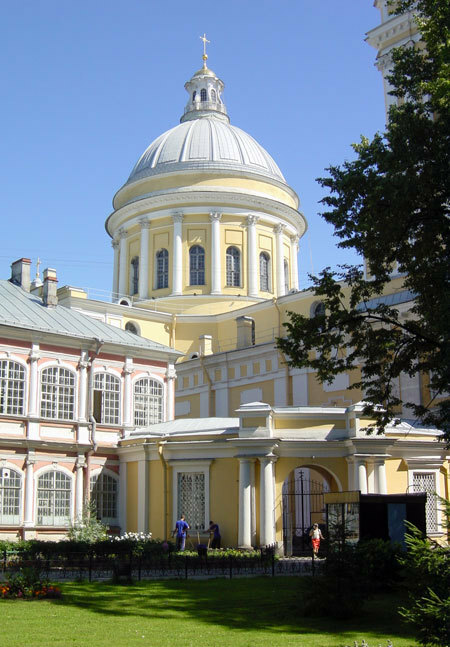 SInce the 1917 revolution, the buildings of the St. Alexander Lavra Monastery were used primarily by the government, except for the Trinity Cathedral (photo to the right) that was one of the few "working " churches in St. Petersburg. Functioning also since the end of World War II is the Theological Seminary and Academy, which is adjacent to the monastery. At long last, in the Spring of 1996 the Lavra itself was given back to the Church by the Sate, and reopened as a monastery.